I am sitting on the floor, with a large pile of paper. When I say large, I mean 72 printed pages. Looking at the stack I'd say it would be similar in size to the first half of the Oxford English Dictionary. But while that would give you everything from aardvarks to Kurdistan, it appears that this is a singular garment pattern. I am on my hands and knees arranging the pages in rows and columns; painstakingly folding blank edges and matching registration marks. Each edge is being carefully taped in place. I'm trying to beat the breeze which intermittently blows under the door and disrupts the pages before they are secured. Curses. And trying to fend off the family member of short stature is helpfully shuffling the stack of paper. Double curses. Sounds peachy, yes? It is. Until the 72nd page spews forth from your printer. Its only then that you have second thoughts. But by then its too late: you've paid; you've printed. You're committed. Hours of folding, lining up and sticking await (and I'm afraid I don't do tedious that well). The funny thing is that the 72 page pattern, which I am using today, is for a mere t-shirt. Goodness, can you possibly imagine printing a pattern for fancy frock with numerous views? OMG, I have 2 Burdastyle downloads I've been sitting on for weeks for just this reason! I can't bear the thought of printing out all the pages and taping them together -- and THEN what do I do with it? Meanwhile I have a zillion tissue paper commercial patterns neatly folded in their respective envelopes. Why bother with the downloads? Hahaha, I think I always smile when I read your posts. On the subject though: I think the advantage of printing patterns is that after all the aligning and taping you can just cut the sizes you need. 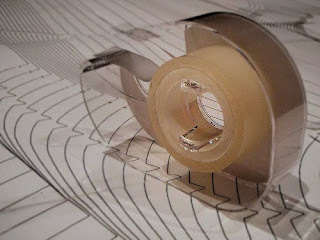 No tracing to be done, because when you cut into the pattern and need it again later, you can just print it again. And let me tell you: I really, really dislike tracing patterns. So, big pre for me. Anyway, I look forward to seeing that t-shirt you are making. With all these pattern pieces it must have some very interesting details! ~laffin' - you are so right! I've only made children's clothing and toys with downloadable patterns, so the pieces aren't that large, but putting together the pattern-piece puzzle is a chore nonetheless. Oh dear... sounds like a paper jigsaw! Aaaah i have enough problems cutting out patterns that don't need to be stuck together first! Good luck with that one. I recently downloaded a "free" pattern from a blog, luckily it wasn't of the "jigsaw type" but by the time I took the file to Officeworks and printed it, I might as well have purchased the actual pattern. Why do you do this to yourself????? 72 pages! I don't know what it costs *you* to print pages, but by the time I printed that it would have been cheaper to buy a pattern, I think! I'm a bit puzzled by comments indicating that you need to trace tissue patterns. Do you? Because I've always cut out tissue patterns, multi-size or not! Really? You crazy lady. Just buy the damn pattern and get on with it I say! TOTALLY with you - I spend most of my days sticking (my own) patterns together when I'm testing them (I outsource the wide-format printing for the final prints. During product development it's just me and a little A4 inkjet printer). TEDIOUS barely describes it when you get up to A0 size patterns printed in A4 paper jigsaw format. And people wonder why I don't sell my patterns as downloadable pdf's...? Yours and Carmel's comments validate several of the reasons I sell full-size paper patterns. Anyhoo.... rant over.. I hope the T-shirt is a winner, and that you make loads and loads of them - reducing your sticky-tape-hours-per-garment, if you know what I mean. Mmmm, I have a couple of wads of paper which were forests in a previous life but now are a pattern...at over 150 printed pieces of paper. And have you ever noticed that, however schmick and well done they look, they just never match up perfectly when you are trying to hold them in place with your knee, sticky tape in one hand, your other hand wiping your sweaty brow? Better you than me! Not only can you manipulate pattern pieces, you can actually sew really well too! I dread to think what could happen if you stick one in the wrong place. Nothing worse than a sleeve at the back of your T shirt. its a complete negative opportunity cost.....I cant even come to the free burda downloads! !